3D printing technology has been developing rapidly and is now widely used in various fields. However, the utilization of this technology in fashion products has been relatively slow. Therefore, in this study, we attempt to determine the limitations of the 3D printed clothing production process and suggest complementary measures to offset those limitations. To attain these goals, we created actual clothes using a FDM type 3D desktop printer, which is a commonly used type. Three different types of 3D printed clothes were produced based on certain geometric shapes using TPU or ABS as printing materials. The limitations of the materials, the modeling programs and the printing, manufacturing and wearing processes were examined, and several suggestions to overcome each of the limitations were presented. Based on this research, it is expected that more diverse and active attempts to utilize 3D technology will be pursued by those who develop various fashion products. 3D printing technology is one of the most significant technologies of the fourth industrial revolution in many industries, and the fashion industry is no exception (Sim 2017). Gartner’s report predicted that the medical, aviation and consumer goods industries will see rapid increases in the adoption of 3D printing technology (Basiliere 2017). Newly built aircraft that will contain 3D printed parts will reach 75%, doctors who will use 3D printed models for simulations before actual operations will reach 25%, and the world’s Top 100 companies that will develop customer-customized 3D printed products will reach 20% (Basiliere 2017). As patents for Fused Deposition Modeling (FDM) and Selective Laser Sintering (SLS) 3D printing technology expired on 2009 and 2014 respectively (Lee and Lee 2016), 3D printing technology is expanding its areas of application into various industries, including the fashion industry. Global 3D printer manufacturing companies such as Stratasys and 3D Systems are collaborating with fashion designers to exhibit distinctive designs, and Time included Stratasys’ 3D printed fashion design in collaboration with Iris Van Herpen on the list of the 50 best inventions of 2011 (David 2012). However, while 3D printing technology is actively researched and developed in other fields, the utilization of 3D printing technology has been relatively less pursued in the fashion industry due to limitations related to materials, difficulties in the acquisition of the technology and the fact that the product should be worn on the human body. There are a number of important earlier studies related to 3D printing technology in the fashion industry. Most focus on different production methods (Vanderploeg et al. 2017), while other continuing studies include; work to offer new conceptual models of adapting 3D printing technology (Sun and Zhao 2017), on how to learn about 3D printing technology (Kwon et al. 2017), on the 3D printing materials used to create textiles (Lee and Hong 2016), and one study on the use of 3D printing technology to develop new designs (Chun 2017). While many have studied 3D printing technology as used in the fashion industry from different viewpoints, the actual target products were accessories such as jewelry. Consequently, fewer researchers have addressed the actual manufacturing processes of real clothing and analyzed the problems that arise within these processes. This study attempts to develop fashion products, using a FDM desktop 3D printer of the type widely used in many different industries. In total, three types of designs were developed along with related accessories. This study attempts to uncover the basic knowledge necessary to produce 3D printed fashion products. 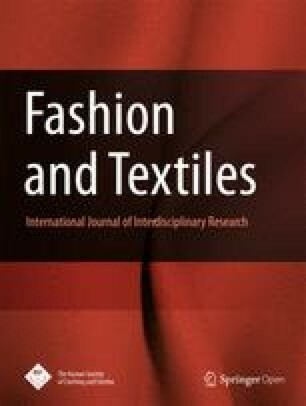 As it is foreseeable that both the usage and demand for 3D printing technology will increase with regard to fashion products, this study is meaningful in terms of developing fashion products, examining the limitations, and suggesting methods by which to improve and enhance the adoption of 3D printing technology for the fashion industry. There are three main types of 3D printers: the Fused Deposition Modeling (FDM), the Selective Laser Sintering (SLS), and the Stereolithography (SLA) types. The SLS type uses a laser to sinter the powder on the bed. The SLS type is used in a variety of fields, as it can express various material textures, create complicated shapes without support, and help make more complete products. However, it is normally used more for industrial purposes than for personal applications due to its price and size. It also needs separate equipment for post treatments of materials. The SLA type uses a laser on liquid resin, which hardens into a solid. While it can be used for personal applications, similar to the FDM type, it has the disadvantage of a high cost (Mongeon 2016). The FDM type was developed in the 1980s by Scott Crump and was commercialized by Stratasys, which was founded in 1988. The FDM type works as follows: thermal filament is supplied to the melting chamber and is extruded through a nozzle, and the melted filament hardens and makes layers to create a three-dimensional object. It is suitable for producing solid products, but their surfaces are rough, compared to SLS and/or SLA type products. Many different types of materials are used for FDM type printing, such as nylon, ABS, PLA (Poly-Lactic Acid), TPU and polycarbonate, among others (Warnier et al. 2014). The results of an examination of fashion design cases that used 3D printing technology after 2015, based on professional websites related to 3D printing and earlier studies, can be summarized as follows. The analyzed cases could be divided into three types: creating whole clothing using only 3D printing, using 3D printed output partially on clothing, and manufacturing accessories and other items separately. First, the ‘Bomber jacket’—the classic case of using only 3D printed materials on clothing—is the most recent 3D printed jacket, exhibited by Danit Peleg, and is a product intended for sale. Due to its manufacturing conditions, i.e., the requirement of 100 h to create one jacket (Deabler 2017), it sells at a price of $1500, with only limited quantities available. Customers can freely have their own choice of linings and colors online (3D PRINTED JACKET 2018). 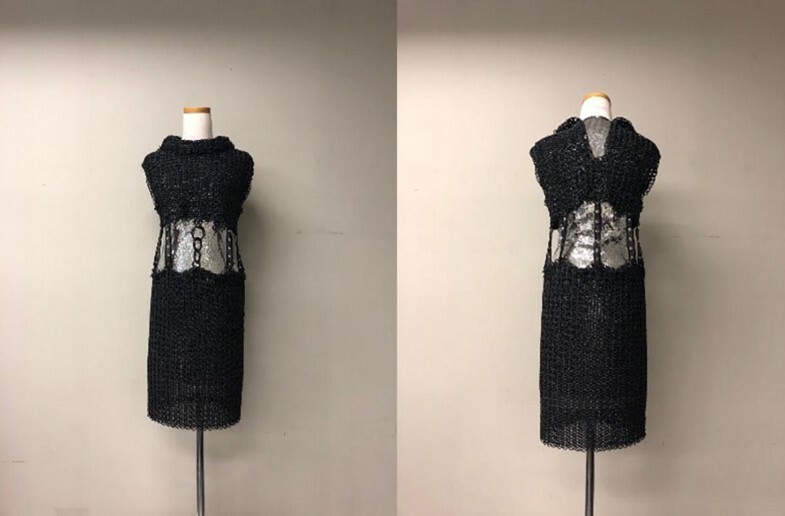 A new 3D printed dress ‘Loom’ was developed by designer Maria Alejandra Mora-Sanchez and Cosine Additive, and it was printed using the FFF type method, using TPU. It was awarded the 2017 Design Concept prize at the Red Dot Design Awards (Julia 2017). Next case shows a case of the partial use of 3D printed materials on clothing. A German designer, Babette Sperling, designed this, using the eco-friendly, biodegradable material WillowFlex. The clothing was completed by printing braille text directly onto the fabric based on the material characteristics of WillowFlex, which adheres strongly to natural fabrics such as cotton and/or silk (Scott 2017). Lastly, the shoes brand Feetz shows a 3D printed pair of shoes, manufactured by a footwear company, Feetz (Millsaps 2016). These customized shoes were manufactured, using a FDM type FFF 3D printer. The material is Flexknit™ polymer filament, which is recyclable and can be extended by 700–800%. As it does not require a post treatment step, customers can receive their appropriately sized pair of shoes in 2 weeks (MADE DIFFERENT 2016) (Table 1). Recently, although cases involving the production of complete pieces of clothing using a FDM type 3D printer are increasing, most cases still involve partial manufacturing and/or the creation of only accessories. Thus, in this study, three full-size clothing are manufactured using a FDM type 3D printer, with the aim of analyzing the limitations of the process and suggesting ways to mitigate them. First, the study researched the principles and procedures of 3D printing by examining related documents. This was followed by a case analysis of fashion items that were created with FDM 3D printing technology for an overview of the use of 3D printing technology in the fashion industry. Next, several fashion products were designed and modeled based on a geometrical motif. Subsequently, they were printed, connected, treated, and completed. Rhinoceros 5.0 along with Grasshopper were used for modeling. Rhinoceros is a program based on NURBS (Non-Uniform Rational B-Splines) (Cheng 2014), a program commonly used in the areas of fashion and industrial design for its natural appearance of the expression of curves. Grasshopper is a program that controls the quantity, location and shape shown on Rhinoceros by means of quantification approach. Cubicreator 2.5 R3 was used as the conversion program so that the modeled designs could be printed (Fig. 1). For the 3D printing process, two entry-level FDM type printers, the Cubicon Single (3DP-110F) (Fig. 2a) and the Cubicon Style (3DP-210F) (Fig. 2b), manufactured by HyVISION SYSTEM were used. The two types of filaments, made by the same company, ABS (Acrylonitrile poly-Butadiene Styrene) and TPU (Thermoplastic Poly Urethane) (Fig. 2c) were used. The Cubicon Single printer has a detachable extruder which includes a nozzle, which melts the filament and prints. The extruder is easy to remove and replace when the nozzle is clogged. The largest output size is 240 * 190 * 200 mm (W * D * H) (3DP-110F(Single) 2015). The Cubicon Style printer also has a detachable extruder and a box type filter. Its largest output size is 150 * 150 * 150 mm (W * D * H) (CUBICON Style (3DP-210F) 2016). A total of three types of designs were developed for 3D printed clothing. The design was based on the most basic shapes of geometry, i.e.,—circles, triangles, and rectangles. These three design types are distinguished by their modeling programs and printing materials. Design 1, based on rectangles, was modeled with only Rhinoceros and was printed using TPU as the material. 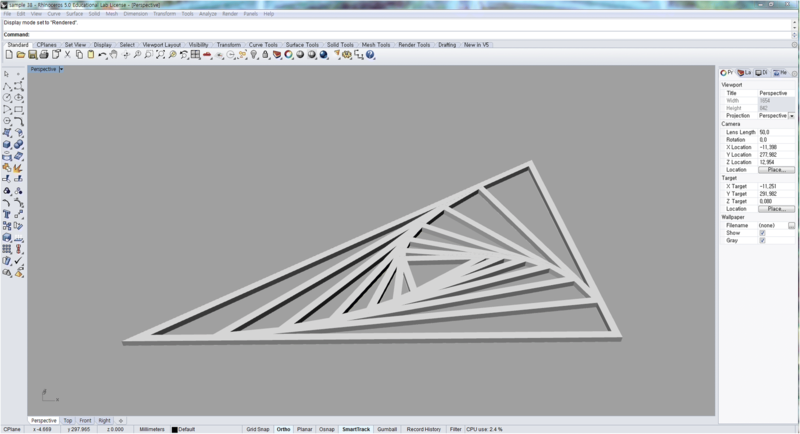 Design 2, based on triangles, was modeled initially with Rhinoceros to set up the base shape, and then with Grasshopper. It was printed out with TPU. Lastly, for Design 3, Rhinoceros was used as the main modeling program and Grasshopper as a backup. It was printed with ABS to differentiate the different designs. Design 1 was created to determine if it would be possible to manufacture 3D clothing without sewing, which is essential in the clothing manufacturing. Design 1 printed the connecting hook that holds the patterns together. TPU filament was used to create Design 1 to ensure a more comfortable feel when the material is made into clothing. Design 1, based on rectangles, was inspired by the work of Donald Judd, who is a minimalism artist (Fig. 3) (Winstead 2015). He is an artist who destroyed the flat features of painting by inflating the rectangular shape into a three dimensional concept called ‘space’ (Raskin 2010). 3D printing technology, which enables the concept of ‘printing’ in three dimensions, is highly involved in Donald Judd’s work. Therefore, Design 1 drew inspiration from his work, which displayed rectangles in a repetitive way. Hence, Design 1 was manufactured by connecting the same patterns repeatedly to create the shape of the clothing. Rhinoceros was used as a modeling program for Design 1. Design 1 was based on the shape of the cross that is formed with two rectangles, 41 * 7 mm in size (W * D), and the height was designed to be 3 mm to give a three-dimensional effect. The cross patterns that form the base are connected through hinges (Fig. 4a) with 5 mm spaces between them. The hinges were modeled to be detachable, with a hole on a fixed plane through which a cylinder fits inside (Fig. 4b). Figure 4c shows one plane fixed onto one side of the cross with a hole for the cylinder, with two planes connected to one side of the cross. The part where the cylinder is attached is connected to the center of one plane of the cross. The height of the cylinder was modeled to be shorter than 7 mm, shorter than a single plane of the cross for ease of detachability. The belt part was slightly modified from the basic unit of the patterns, and the smallest square pattern, 7 * 7 mm in size (W * D) was developed while maintaining the hinge function. 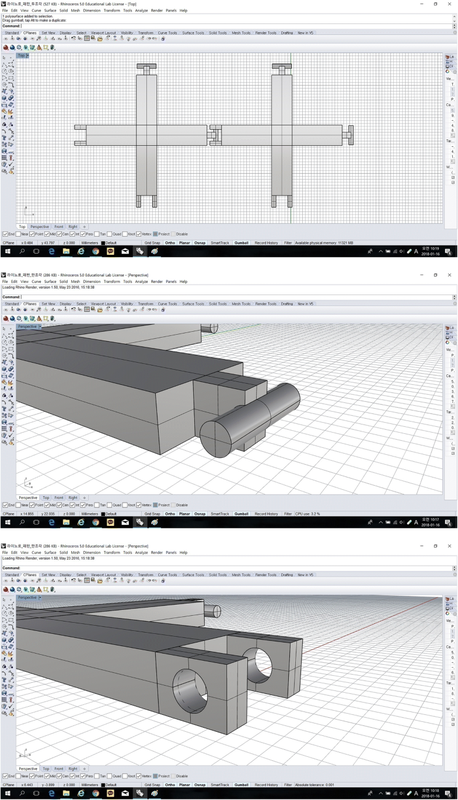 After the modeling of Design 1, Cubicreator v.2.5.3 was used to convert the file format into HVS from STL, after which Cubicon Single was used for printing. As the printing material, TPU was used, as it is beneficial for clothing manufacturing owing to its flexibility and to its texture. The printing environment included a nozzle temperature of 230 °C, a bed temperature of 65 °C, a chamber temperature of 50 °C, and a layer height of 0.2 mm. First, a single pattern to serve as the foundation of the design was printed (Fig. 5a). In this case, 0.55 m (1.67 g) of filament was used to print a single pattern, and it took 9 min and 47 s. The Cubicon Single printer was used to print the highest possible numbers of pieces in a single print—4 * 4 for a total of 16 pieces—to increase the efficiency of the manufacturing process. In addition, since detachable hinges are attached to the developed pattern, printing 16 pieces at a time helped to save time. This printing job took 2 h and 33 min while using 8.53 m (25.64 g) of filament. Patterns that are connected with hinges are both detachable and re-attachable (Fig. 5b): hence, 16 pieces of patterns were printed and then detached to create the desired forms. Figure 5c shows that the printed patterns were flexible and thus suitable for use to create the shapes of the clothing. 390 pattern pieces were used to complete an A-line mid-length skirt out of 400 pieces, requiring 25 instances of printing, with 16 pieces connected per printing job. Design 1 was designed with a rectangle motif, and an A-line skirt was made to highlight the straight line form which was created from rectangles. In addition, innerwear was manufactured and attached to the inside of the 3D printout as the rectangular motif is composed of lines rather than surfaces, and it was impossible to wear only 3D printout. Innerwear is made of stiff, vivid pink PVC to support the weight of the 3D output while contrasting with 3D printout in black color. A petticoat was used inside to create the shape of the A-line. 16 pieces of connected prints were disassembled and then connected into two and three rows, as shown in Fig. 6, and then overlapped alternately. In cases in which hinges became loose after multiple reattachments, a 3D pen was used to reinforce the hinges so that the patterns did not fall apart. In consequence, there were no falling or broken patterns when the wearer walked 50 meters in the clothes. And also sitting on the chair and getting up several times in the clothes did not disassemble the connected parts. The belt part was created by modifying the size of the pattern and two 23 mm-sized nickel buttons were attached on top of it for ease of disconnection. The total weight of the 3D output skirt, including the belt, was 617 g.
The size of the base pattern used in Design 1 was then changed to make a mini-clutch which was 185 * 50 * 110 mm in size (W * D * H). Three patterns—cross-shaped base patterns of rectangles 41 * 7 mm in size (W * D); the same cross-shaped patterns, but with rectangles 18 * 7 mm (W * D) in size; and lastly rectangles 7 * 7 mm (W * D) in size were used. The height of all three patterns was 7 mm, and this part could not be made any shorter because it is the space where the hinges must be detached and re-attached. The mini-clutch had a cuboid form, with the side panels and bottom panel being fixed while the top panel was created so as to be larger than the bottom to serve as a cover (Fig. 7). Design 2 was modeled using Rhinoceros and Grasshopper and printed using the Cubicon Single printer, after which the printed parts were connected. Design 2 was created with the intention of exploring the manufacturing process when printing more complex forms of patterns and designs using Grasshopper. TPU filament was used to create a more fitting form of clothing on the human body. Design 2, based on the triangles, was inspired by a spider web (Fig. 8). As shown in Fig. 8 (Zschokke 2002), spider webs are shown in layered form with triangles of different sizes and shapes. A spiderweb is actually strong unlike how it appears. This strong but flexible property of a spider web is somewhat similar to TPU which is the material of Design 2. The design was created by disassembling and reforming triangles of a spider web. Because wearing only the 3D printout made a wearer’s body too exposed, an innerwear should be worn. The innerwear was designed to give a clear effect to the shape of the 3D printout in addition to showing a strong contrast. Specifically, the innerwear was inspired from the petals caught in a web. 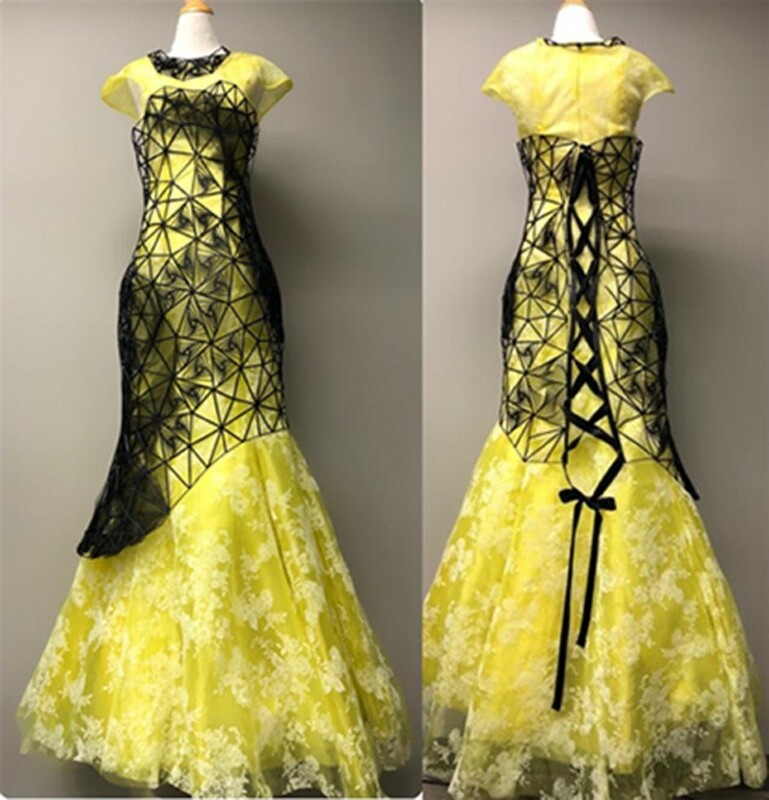 The yellow long innerwear was made of lace and chiffon which are bright, soft and feminine material to give contrast to strong black 3D mini dress. First, the final silhouette of the to-be-3D-printed clothing was drawn using Rhinoceros (Fig. 11a). Next, the basic triangular patterns were randomly arranged and adjusted to a clothing form using Grasshopper. 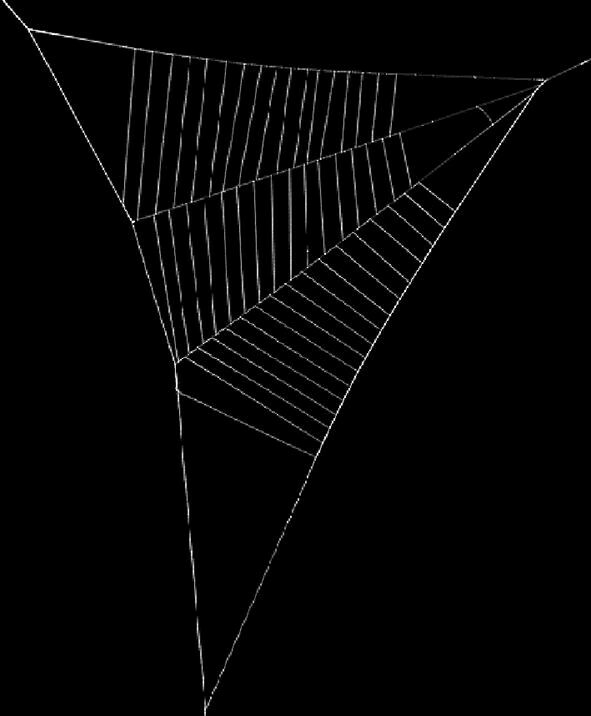 The simple and random arrangement of triangles could not express the complex shape of a spider web. Thus, for a triangle whose sides exceeded 28 mm, the points, 15% inward from the vertices of the triangles, were connected, after which the connected triangles were turned slightly so that the turned triangles could be overlapped in six layers (Fig. 9). The result of applying Grasshopper map (Fig. 10) to a previously created silhouette is shown in Fig. 11b. The total number of triangles used in the clothing amounted to 526, with 492 of them basic triangles and the rest 34 six-layered triangles (Fig. 12a). If each triangle was printed separately, more time would be required. Therefore, as many triangles as possible were printed in a connected state if they were smaller than the size of the printer bed (Fig. 12b). The triangles for the curvy chest parts were applied with curves and printed with support settings (Fig. 12c). For a single, mid-sized triangle, approximately 180 mm (0.5 g) of filament was used, and this took 3 min to print. For a mid-sized layered triangle, 1160 mm (3.5 g) of filament was used, and this took approximately 24 min. Printing a triangle in the form of lines rather than surfaces has the advantage of stretching effect and flexibility of TPU material, but it may be broken or its triangular shape cannot be maintained if the line of the triangle is too thin. Thus, a large triangle, which is layered with small triangles inside, can have adequate stretch effects while preventing the shape from collapsing. Prior to connecting 3D print outputs, a connection test was conducted using glue, wires and sewing techniques which are cheap and readily available materials. First, the multi-purpose super glue (AD127 of 3 M) used had low adhesive power and the outputs were detached due to its low adhesive power (Fig. 13a). 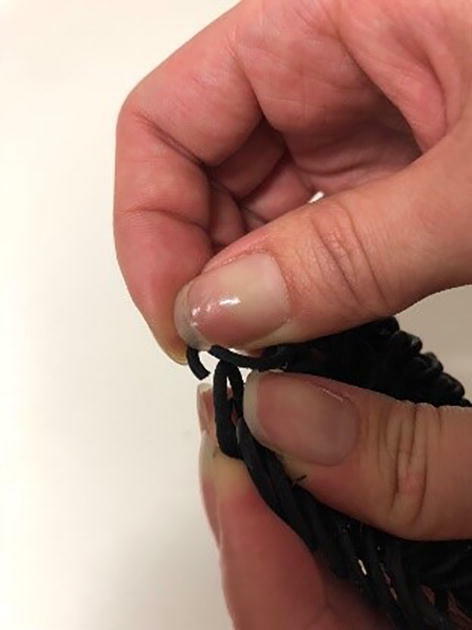 Secondly, sewing with 0.16 mm transparent Nylon thread was an option for firm connections with the stitching outwardly invisible (Fig. 13b). Though the printouts are tightly interconnected, the stitched thread was not easily visible on the surface. Thirdly, 0.2 mm copper wire was used to connect the line of two triangles, wrapping them while holding them together (Fig. 13c). The thickness of the thread or wire was determined to the extent that it was not easily visible on the surface and that it could not be broken easily. The result was strong in terms of the connection strength, but was not aesthetically pleasing. Thus, the printed TPUs were finally connected by means of either sewing or wires. To measure connection strength, nine triangles, one side of which was 60 mm long, were connected to the length of about 300 mm, and pulled it until it is increased by 30 mm. As a result, the printout connected with glue was easily separated, while the printout connected with the other two materials remained unbroken. The back was then fixed using a ribbon that is connected in the form of a zigzag akin to a corset. This was because a corset with a ribbon is the easiest form to adjust to various wearers’ body shapes than any other closure methods. The finished result is shown in Fig. 14: the overall weight of the dress including the innerwear is 971 g, while the 3D printed dress is 370 g including the connected parts. As a necklace is an accessory that touches the human skin directly, it was connected using transparent threads instead of wires so as not to harm the skin. Moreover, to entangle the necklace, the fitting part was printed to have a round groove. The reason for using this closure method was that it was easy to wear or remove, and did not easily disconnected. An image of the finished product is shown in Fig. 15. Design 3 used Rhinoceros and Grasshopper to model the base unit pattern, after which the printed patterns were connected by hand to have organic connectivity. Unlike Design 1 and 2, Design 3 was originally meant to utilize a dense knit structure which could naturally make the best of the curve of a human body. 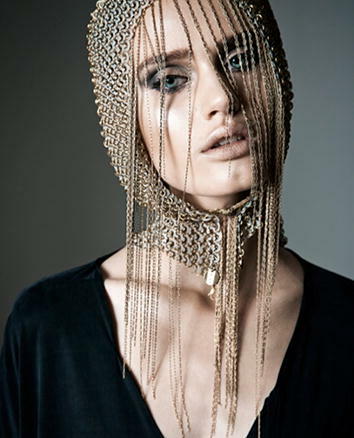 The design was inspired by a medieval knight helmet which had a circular chain structure. Design 3 was set to the concept of ‘the military look’, with the chosen color being black and the material used ABS, which has a powerful physical property. ABS is more solid and economical than TPU, and easy to remove the support structure which is an essential element for printing a circular structure. This design was developed to ascertain if it would be possible to make clothing with only 3D printed materials. Design 3 is a pattern in which circles repeatedly intersected. It was developed to fit the human body, as shown in Fig. 16 (Punx Not Dead 2013). Although certain previous studies developed basic patterns for knitting using intersecting circular rings (Lee et al. 2015; Lee and Lee 2016), Design 3 differs in that it used only 3D printed rings to connect the patterns instead of aluminum O-rings. Rhinoceros and Grasshopper was used to develop basic patterns (Fig. 17a, b). A printing test was conducted to determine the most suitable size of the circles to ensure the fit of the clothing on the body. The printing test involved different circumference values of—15, 20, 25, and 30 mm (Fig. 18a). To determine the suitable sizes, a set of 9 circles in a 3 by 3 configuration were printed according to the size. Considering both adhesion to the human body and the ability to overcome the weight of the clothing, circles 15 mm in size and 2 mm thick were chosen as the basic pattern (Fig. 18b). Because Design 3 used the Cubicon Style printer, the Cubicreator settings were set to the style 3DP-210F. To ensure the organic, connected printing of the circles, additional support and a raft as a means of floor support were established. Considering the largest production size on the bed of the Cubicon Style printer of 150 * 150 mm (W * D), a single unit 100 * 70 mm (W * D) in size was printed with 10 circles for both the height and the width. A single print used 8.85 m (22.15 g) of ABS. The printing time was slightly longer at 5 h and 5 min. For the connection of the basic patterns, the printed units were assembled by hand, unlike Design 2′s TPU, as it is possible to attach ABS patterns with multi-purpose glue made by 3 M (Fig. 19). Because ABS printout of circles is deformable with multi-purpose glue, Design 3 could be completed by connecting only 3D printed rings. Design 3 was intended to be worn separately from innerwear. Moreover, the top and the bottom were made separately considering the weight of the clothing. The length of the top was from the neckline to the bottom of the breast line, and the length for the bottom was from the waist to the knee line. Therefore, the innerwear of the wearer could be seen at the waist part of the clothing. To display the shape of circles on the black chain outerwear clearly, the innerwear, a sleeveless basic one-piece garment, was made separately of silver spangled fabric. The front center line of the top and the bottom was connected with circle rings of various sizes, and the side line and back center line were connected with straps to complete the entire piece of clothing (Fig. 20). In total, an amount of 1,464 g of filament was used to print the entire piece, with 546 g in printing basic patterns for the top and 910 g for the bottom. The front center rings weighted 8 g. Design 3 required more filament for printing the same area than Designs 1 and 2, and thus had heavier weight. This was due to the fact that the ‘infill’ option which indicated the rate for filling inside the model was set up to ‘medium (50%)’ from the default ‘light (10%)’, because ABS is easily broken when thinly printed during the printing process. In Design 3, in spite of the weight due to the ‘infill’, the knit structure had the advantage that the wearer could move freely. Therefore, it is recommended that clothing of lighter knitted structure with more solid material, minimizing the amount of infill, would be more comfortable to wearers. The following is a summary of the issues revealed during the entire process of producing Designs 1, 2, and 3, involving the processes of design, modeling, printing, and making the clothing and accessories. First, there are limitations when using the materials used with a FDM type desktop 3D printer. While a SLS or SLA type 3D printer uses powder or liquid types of materials, a FDM type 3D printer can only use solid materials such as ABS, PLA, and TPU. In this study, the flexible TPU and the solid ABS were compared. PLA is also often used in a variety of fields due to their solid properties, but is not suitable for manufacturing fashion items as it is less robust and more difficult to remove supports than ABS. The solid material ABS offers high-quality output, but it needs a post treatment step due to the considerable surface roughness. The more flexible TPU offers a smoother surface, but it is difficult to remove the supports when it is printed together with this material. Some design variations were possible for TPU printout even after printing due to its flexible nature. In particular, Design 2 was modeled as thin as possible so that the 3D printout could be bent to fit the body. However, TPU has a limitation in creating diverse designs such as a design with severe curves due to its difficulty in removing supports. In contrast, the ABS printout has difficulty in modifying the design after printing, but removing of supports is so easy that various delicate designs, such as round rings of Design 3, can be produced. For connecting patterns, because of unbreakable nature of TPU, it was possible to make hinges in Design 1 or to print thinly in Design 2, to be threaded with needles. In the case of ABS, it was not possible to make hinges because of breakable nature of ABS, but patterns could be connected using glues. Thus, Design 3 used glue to connect patterns. Moreover, when stopping the 3D printing, the extruder, which melts and pushes out the filaments, cools down, after which the filament remaining in the nozzles of the extruder becomes clogged. In such case, the extruder must be detached to clear the nozzle to avoid malfunctions due to machine errors. For ABS, there is less clogging and sticking on the surface when the extruder cools down as it maintains a solid shape at room temperature. However, TPU, due to its viscosity, adheres to the nozzle when the extruder temperature decreases and readily causes clogging. In this study, three clothing was produced using a combination of fabric and 3D printout. In the case of Design 1, stiff fabric such as PVC was used to support the 3D printout while maintaining its shape, but the combined weight of the 3D printout and the fabric made a wearer uncomfortable. While Design 2 and Design 3 were able to form a naturally falling silhouette using soft fabric, but as the weight of 3D printout became heavier, the fabric became more sagging. Therefore, soft fabric had a limitation when being used with 3D printout. 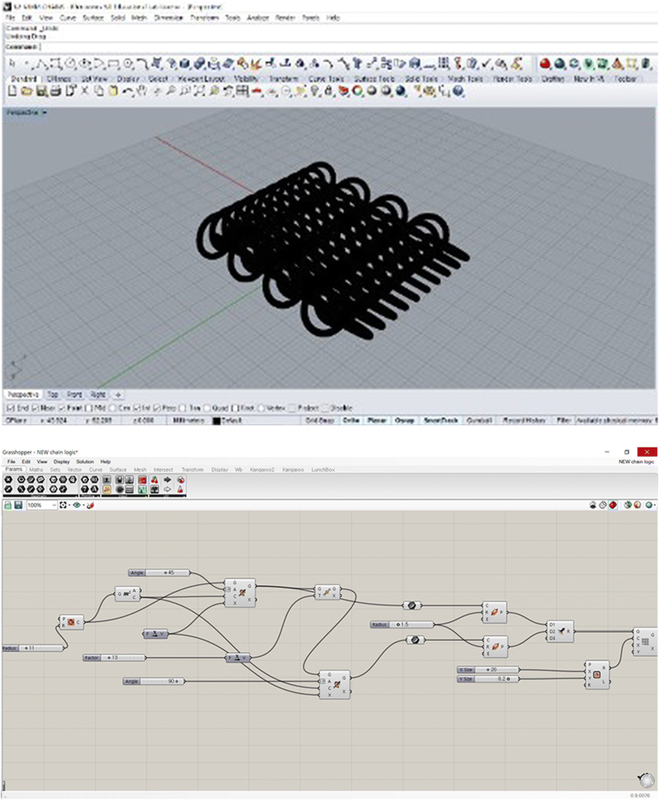 Three problems arose while using the Rhinoceros and Grasshopper program for modeling. First, the program itself was difficult to use; thus, basic education or training is required to improve accessibility to this program. For beginners, this can be an obstacle during attempts to develop various forms of clothing products. Secondly, it is difficult to develop various patterns that are suitable for the human body. When using Rhinoceros, each pattern must be drawn individually to create irregular patterns. For Grasshopper, the patterns can simply be applied by repetition or randomly, but it is difficult to develop different shapes and patterns. Moreover, partial adjustment of Grasshopper is difficult after applying the values to the overall result. Third, there is a limit when developing patterns using only one program. In Design 2, Grasshopper made it possible to align a complex arrangement of triangles of different sizes randomly rather quickly and easily. However, it was impossible to add hinges or to make partial adjustments. Grasshopper itself has the problem of being difficult to use when compared to Rhinoceros. Using Rhino and Grasshopper, the difference of shapes in the whole silhouette according to the motif size could be checked and adjusted during the modeling process, and it was also advantageous to adjust easily the size and arrangement regularly or randomly by digitizing the map. On the other hand, using other light programs for modeling the large-sized items such as clothes requires much time, when compared to the modeling of the small-sized items such as accessories. In addition, each motif has to be directly drawn one by one for those programs. It is inefficient in that there may be more errors and it takes more time. The issues of the printing size and the printing time were revealed when using a FDM type desktop 3D printer. A FDM type printer has the advantage of a low cost relative to those of other types of 3D printers, but a large FDM printer is as expensive as other types of 3D printers, which makes it difficult for the general public to use. The 3D printer used in this study was a desktop type, complete with size and time limitations. These limitations lead to increases in both the number of outputs and the output time, which ultimately increases the price. Moreover, the FDM type 3D printing speed is comparably slow. Printing a single unit of a basic pattern takes a minimum of 30 min, and printing an entire piece of clothing requires multiple printout processes, consuming much time and effort. Therefore, in this study, we tried to simplify the design and the pattern, and to model them without support as much as possible to minimize errors and time. The issues which arise during the process of making clothing after printing are as follows. First, connecting the printouts require separate work which must be done by hand. In the case of ABS, used in Design 3, glue was used to connect the patterns. In the case of TPU, used in Design 1 and Design 2, sewing or wires were used to connect patterns, as glue did not work. A tool such as a 3D pen could be used for modifications to complete the entire piece of clothing. Secondly, a post treatment step is needed to increase the overall quality of the completed product. For ABS, a process of smoothing sharp parts of surfaces is needed, and for TPU, as it cannot be sanded, it must be trimmed individually. This may be the greatest problem which arises during the manufacturing process, as it increases the manufacturing time and complicates the printing process. The limitations related to the wearing of the clothing are as follows. First, the weight of the clothing is heavier than that of normal fabrics, which makes it more difficult to wear for extended times. Therefore, partial modification of the design is needed to take the weight of the clothing into account. For Design 3, there were several difficulties when attempting to fix the bottom of the clothing to the body due to the weight of the materials. As the designs of curved parts such as the shoulders, armpits, and elbows could not be delicately manipulated, a complicated design could not be realized. Secondly, ABS and TPU can easily break or become disconnected. Hence, a considerable amount of time was needed to put on the clothes, as great care is necessary with it. Moreover, the wearer cannot sit or move freely. In this study, the motif pattern itself was supplemented by giving elasticity, and the thigh part was intended to reduce the restriction on movement by giving a slit or space to an A-line skirt. Specifically for Design 1, hinges were used to supplement the disconnection due to movement, and for Design 2, the best connection method was chosen among three connection methods. Lastly for Design 3, the ring chain shape was used to complement flexibility. Although TPU showed little breakage due to its physical properties, ABS could not completely prevent breakage due to the nature of the material. Thirdly, even after the post treatment step, a rough feel of the surface ensured. This may create discomfort by irritating the skin or may even damage the innerwear. This research was conducted to examine the present cases of the use of 3D printing in the fashion industry and to analyze the limitations after manufacturing three types of clothing and accessories using a FDM type desktop 3D printer of the type most commonly available. By making clothing and accessories under different conditions, this study aimed to find precisely the factors that obstruct the use of 3D printing technology in the fashion field. As noted above, several limitations were found during each process related to the—materials, modeling programs, printing processes, creating process and the wearing of the clothing. Suggestions on means of improvement that may overcome these limitations are as follows. First, immediate development is needed with regard to materials. A material that has sufficient flexibility to express the curves and movement of the human body and with adequate hygroscopicity and breathability to offer pleasant sensations by the clothing should be developed. Moreover, 3D printing technology will become adopted more in the fashion industry if a material that is easy to remove from the support and does not clog up the nozzles through which it is extruded were to be developed. Secondly, a modeling program must be developed. Modeling programs currently available are designed to work well with the engineering or construction fields. Thus, beginners in other fields cannot easily operate these programs, and the programs require high-speed computers, creating another barrier to greater accessibility. Most designers who are currently exhibiting 3D printed fashion design their work by drawing in a conventional manner first, after which they hire or collaborate with experts to model their designs. This type of limitation prevents the designer’s implementation of his/her thoughts, and it is an obstacle to the creation of fashion items with different designs. More patterns and items could be developed if a program specialized for the creation of clothing or accessories could be developed, and realizing such a program will remove barriers for entrepreneurs or designers. 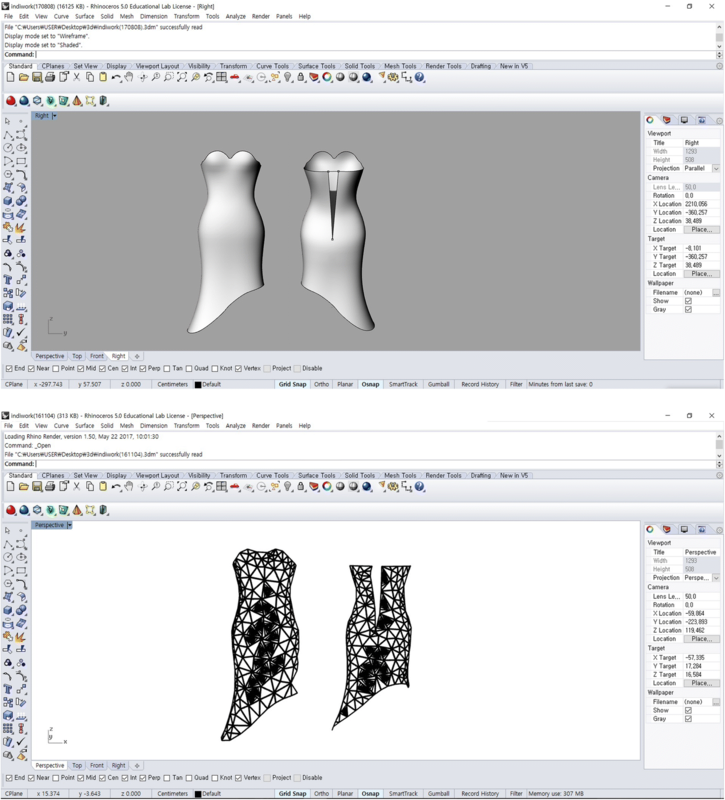 In particular, it is essential to supplement the following three functions to modeling programs: the function of implementing human body shapes easily; the function of adjusting major sizes such as chest sizes, waist sizes, heap sizes, back length, and so on; the function of adding patterns to the clothes. When these fashion-specific programs are prepared, individual designers can easily model various styles of clothing. Thirdly, different and various attempts must be made during the manufacturing process. If there are developments in the areas of materials and equipment in the future, it will become possible to use different approaches to connect printouts. As shown in this research, if the modeling includes connecting parts, the connection process could be quicker and easier and would not require additional tools. Therefore, if various connection models were to be developed, it will result in shorter manufacturing time, which would in turn lead to various utilizations of 3D printing technology. Fourth, studies of post treatment steps are needed to increase the quality of the end products and to decrease the time and cost of the manufacturing process. This will lead to greater merchantability of the created items. If 3D printing technology is seriously adopted in the fashion industry, the complex steps during the conventional process of clothing production, i.e.,—designing,—patterning,—sewing,—sampling,—modification,—production,—and—sales,—can be reduced and simplified to designing,—modeling,—printing,—and—sales. This will increase the number of individual designers and entrepreneurs who design and sell independently. This study has examined the problems which arise during the process of designing and manufacturing by individuals who use the most accessible 3D printer in terms of price and size, i.e., the FDM type desktop printer, to make their items, after which several suggestions to improve those problems were proposed. The development of new materials and new technologies requires a considerable number of attempts and great effort. 3D printing technology is a notable current technology that is rapidly developing. This is why different industries are working actively to utilize 3D printing technology to reduce costs and increase efficiency. This study is meaningful in that it used an FDM type desktop 3D printer in the field of fashion, where the usage rate of 3D printing technology is relatively low compared to that in other industries, in that it developed three designs with which to discuss the possibilities and limitations related to the adoption of 3D printing technology in the fashion industry, and in that it made several suggestions to improve the current situation. During the process of this study, due to limitations on printing methods and materials, the difficulty in making wearable clothing with only 3D printout was revealed. Thus, fabric was used together for the production of clothing to supplement such limitations. However, if the development of material and printing methods and the subsequent studies on various motifs and connection methods continue, the introduction of the 3D printing method to the fashion industry will be accelerated. This will have an innovative impact on efficiency. In addition, if a wearing test frame, including elements such as ease of operation and foreign body sensation, is provided, it is expected to help the 3D printed clothing into practical use. We hope that the utilization of 3D printing technology will increase in the field of fashion and that many follow-up studies will be conducted based on the findings of this study. JC played a leading role in the planning and organizing this research. YH developed ‘Design 1’, SK developed ‘Design 2’, and HS developed ‘Design 3’. All authors conducted the analysis of limitations of making fashion products using a FDM type desktop 3D printer. All authors read and approved the final manuscript. This work was supported by Research Institute of Human Ecology in Seoul National University. Basiliere, P. (2017, December 12). Gartner predicts 2018: 3D printing changes business models. Gartner. Retrieved from https://blogs.gartner.com/pete-basiliere/2017/12/12/gartner-predicts-2018-3d-printing-changes-business-models/. CUBICON Style (3DP-210F). (2016). Cubicon. Retrieved from http://www.3dcubicon.com/. 3D PRINTED JACKET. (2018). DANIT PELEG. Retrieved from https://danitpeleg.com/product/create-your-own-3d-printed-jacket/. David. (2012, March 9). TIME Magazine names Iris van Herpen’s 3D printed dress one of the 50 Best Inventions of the 2011. i.materialise. Retrieved from https://i.materialise.com/blog/time-magazine-names-iris-van-herpens-3d-printed-dress-one-of-the-50-best-inventions-of-the-2011/. Deabler, A. (2017, July 28). World’s first 3D printed jacket costs $1,500. NEW YORK POST. Retrieved from https://nypost.com/2017/07/28/worlds-first-3d-printed-jacket-costs-1500/. 3DP-110F(Single). (2015). Cubicon. Retrieved from http://www.3dcubicon.com/. Julia. (2017, August 6). This flexible, expandable 3D printed dress adapts to your body’s movement. http://www.3ders.org. Retrieved from http://www.3ders.org/articles/20170806-this-flexible-expandable-3d-printed-dress-adapts-to-your-bodys-movement.html. MADE DIFFERENT. (2016). Feetz. Retrieved from https://feetz.com/3d-printing. Millsaps, B. B. (2016, October 18). 3D Printed Shoes Debut in Feetz@DSW Pop-Up Shops in NYC and San Francisco. 3DPRINT.COM. Retrieved from https://3dprint.com/152851/feetz-3d-printed-shoes-dsw/. Punx Not Dead. (2013, January 8). Punx not dead by Maciej Bernas for design scene. DESIGNSCENE. Retrieved from http://www.designscene.net/2013/01/wave-maciej-bernas.html. Scott, C. (2017, January 11). Fashion designer babette sperling uses willowflex filament to 3D print secret messages in natural materials. 3DPRINT.COM. Retrieved from https://3dprint.com/161341/babette-sterling-fashion-design/. Sim, H. (2017, December 3). 3D printing in luxury fashion: revolution or evolution? Forbes. Retrieved from https://www.forbes.com/sites/herbertrsim/2017/12/03/3d-printing-in-luxury-fashion-revolution-or-evolution/#8d7717c3f205. Winstead, E. (2015, December 18). Approaching Donald Judd. GUERNICA. 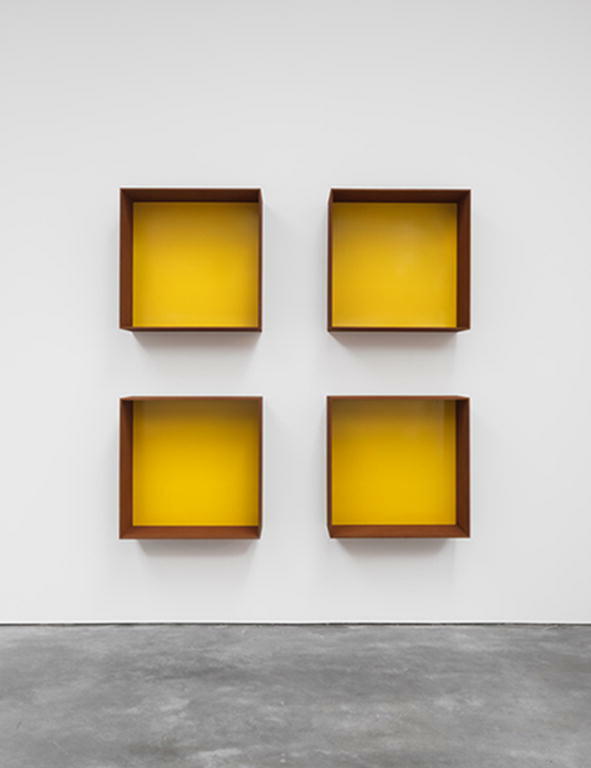 Retrieved from https://www.guernicamag.com/ed-winstead-approaching-donald-judd/. Zschokke, S. (2002). Hyptiotes paradoxus. University of Basel. Retrieved from https://www.conservation.unibas.ch/team/zschokke/spidergallery.php.